Kimberly-Clark Announces Layoffs, Along With $3.3 Billion In Operating Profit : The Two-Way Kimberly-Clark plans to cut up to 5,500 jobs — about 13 percent of its workforce — and get rid of 10 manufacturing plants, as its CEO cites "a challenging environment." 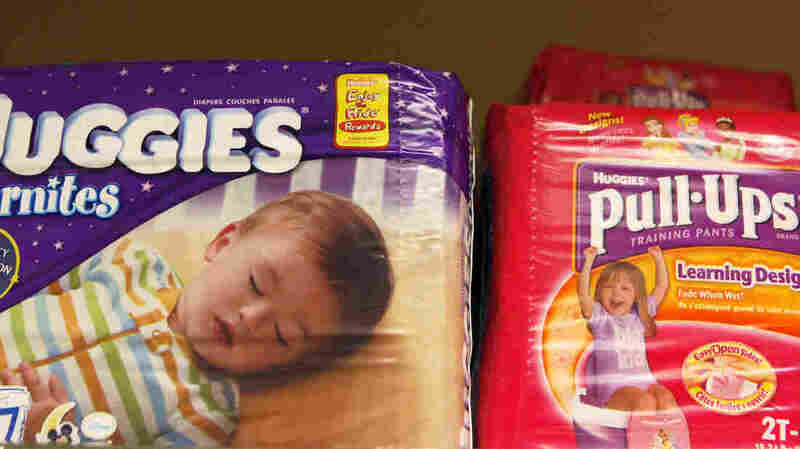 Kimberly-Clark, maker of Huggies and other well-known brands, plans to cut more than 12 percent of its workforce in 2018. Kimberly-Clark plans to cut up to 5,500 jobs — about 13 percent of its workforce — and get rid of 10 manufacturing plants, releasing a restructuring plan along with its year-end results that showed net sales rose to $18.3 billion, up slightly from 2016. The maker of popular brands such as Kleenex, Huggies and Kotex, Kimberly-Clark says its operating profit for the fourth quarter of 2017 was $812 million — a drop from $839 million in 2016. For all of 2017, the company is reporting nearly $3.3 billion in operating profit, down slightly from 2016. Chairman and CEO Thomas J. Falk cited "a challenging environment" in a company statement about its layoff plans. Kimberly-Clark says it will close or sell about 10 manufacturing facilities and expand production capacity at several other sites. "The company says the restructuring program could save up to $550 million," NPR's Adelina Lancianese reports for NPR's Newscast unit. "Personal care companies are struggling as stores compete with online retailers by offering discounts or creating their own private label products. Procter & Gamble also announced that its grooming sector has been hit hard by store discounts." Kimberly-Clark's restructuring, Falk said, "will make our company leaner, stronger and faster." On its website, Kimberly-Clark says that it currently employs 42,000 people in 35 countries and that "nearly one-quarter of the world's population purchase our products every day." As it announced financial results and layoff plans, Kimberly-Clark's board of directors also approved a 3.1 percent increase in the company's quarterly dividend for 2018, which it says is the 46th consecutive annual dividend increase for shareholders. Falk noted that in 2017, Kimberly-Clark "returned $2.3 billion to shareholders through dividends and share repurchases." The CFO of Kimberly-Clark just said on a conference call that the tax cuts "provides us the flexibility" to pay for the "restructuring" plan. In other words, the tax cut is funding the job cuts. In the wake of Republican-backed changes to the U.S. tax code, several large corporations have given employees raises and increased benefits. But there has also been bad news. For instance, Walmart announced better pay for new employees on the same day that it said it would close 63 stores. Providing some details about its taxes, Kimberly-Clark says, "The fourth quarter effective tax rate was 19.2 percent in 2017 and 35.7 percent in 2016. The rate in 2017 included a net benefit as a result of U.S. tax reform and related activities."